Best Cross Trainers For The Home Here! Buying a good quality cross trainer for your home can be quite expensive, this is why doing your research and due diligence will really pay off and you’ll thank yourself for it. My name is Matthew Thornton and I am a Personal Fitness Trainer and Dietician. People generally seek my advice and assistance when they want to become physically fit and when they want to detox their bodies. I have created this site to serve as a buying guide for those of you looking to buy a cross trainer for your home. It may be your first fitness equipment that you have invested in or you may already have a rowing machine, treadmill, weight lifting set or something else. Either way, the information on this site will give you all the knowledge you need to make an informed decision. The information served to you on this site is to give you sufficient knowledge on the products reviewed and compared. Enough to make your buying decision. I believe cross trainers to be one of the best physical exercises you can do, both for cardio vascular exercise, body conditioning and targeting specific body parts. Exercising on the cross trainer will give you a less strenuous workout session when compared to the rowing machine or running on the treadmill. Running, whether outside or on the treadmill can damage your joints in the long run. With every step you take you are causing the impact of your body weight on your legs, in particular your knees and secondary to that your spine. While there is no doubt that the benefits and the intensity associated with running is great, does it outweigh the risks and damage involved? The rowing machine takes out all the impact of working out, which in all honesty is something I definitely advocate. However, poor form on the rowing machine can cause back strain. While initially this may not be a huge concern, it can, overtime lead to further problems. Another good point for the cross trainer is the fact that you control your movement. The resistance is controlled by the cross trainer but the movement is all you. Take a treadmill for example, the movement is created by the machine and you follow the machine. Are Cross Trainers Good For Bodybuilding? What Exactly Is Elliptical Training? An Effective Workout? As said, cross trainers allow you to workout effectively with relatively low impact. Even though the impact is low you can certainly up the intensity. Performing workouts like HIIT or LISS on the cross trainer are not only very effective but also very easy at just the press of a button. The budget cross trainers use air and tend not to give you an effective workout. Therefore the cross trainers reviewed on this site will only be high quality models. Within one workout you have targeted each muscle group and also completed a 5 minute high intensity. If you wanted to, you could spend one whole workout focussing on toning or strengthening a specific muscle group so for example if you are training for a marathon then you could spend the entire workout on legs. This targeting of muscle groups and being a low impact workout is why I prefer the cross trainer over any other home fitness exercise equipment. With technology constantly advancing in any given industry, we have advancements in cross trainers too. Most of the mid-range to high-end cross trainers have a user profile setting. For example, if you have four in your house hold who would use it, you can set a profile for each user. By entering basic statistics like height, weight, age and BMI; your trainer would track your progress. Some of the clever cross trainers actually sync this data using internet connection. When you start working out; you enter the user that you are and work away! Thats it! The cross trainer will do the rest for you. This feature for individual profiles and tracking your progress is crucial in striving for optimal fitness health. It is much more user friendly than just writing it down and tracking it manually. We have the technology; why not make use of it!? An important feature to have, the heart rate monitor does exactly that; it monitors your heart rate while you work out. Keeping an eye on your heart rate is important so you know where you are with regards to your physical fitness. The heart rate monitor is especially important if you are doing HIIT or LISS training where you have to keep your heart rate at a certain level. Most decent cross trainers have the heart rate monitor sensors right on the handles, they measure your heart rate based on the pulse in your hands and then feed this back to the console so you get your beats per minute. Some manufacturers include chest straps with their cross trainers. Chest straps also measure your beats per minute so you don’t need to hold on to the bars and still have your heart rate monitored if you so wish. Chest straps are generally more reliable than the hand sensors. One reason is because the hands can get sweaty and moist giving you an inaccurate reading. The preset training feature is available on anything beyond the mid-range level of cross trainers. The preset workouts include targeted exercise for things like targeting specific muscle groups, fat burning, body conditioning and strength building. On the higher end models you could even have pre-set workouts which are based on your statistics. The cross trainer knows your stats and fitness level, given this information it tells you where it thinks you should be with regards to resistance level and duration. The first and one of the most important factors to keep in mind is how long is the warranty for and what does it cover? Since you are making an investment, depending on which cross trainer you opt for, it could be a high end model which means it will be fairly high in price. Paying for a high quality cross trainer is certainly something I always advocate as it is an investment that can benefit you for years. High quality cross trainers also give you many worthwhile features that lower end models do not. Having a warranty for a year is pretty much the industry standard but some manufacturers will actually go one better and give you a warranty for three, five and even ten years. This is definitely worth considering. Is the warranty a return to base warranty? If this is the case then who pays for the shipping? Also, remember, if you are shipping it back then you will have to dismantle it and then re-assemble it when you get it back. Some manufacturers cover a call-out service within their warranty so if you did need someone to look at it, they would come to your home and fix the issue. This is the best type of cover as it doesn’t leave you out of pocket on shipping costs nor will you end up spending time to dismantle and reassemble it. So all important things to consider about the warranty. The console is where the action is. It is the control board of your cross trainer. The budget cross trainers have budget consoles. They give you a very limited amount of information. The decent cross trainers have good, detailed and informative consoles. Your console is basically the control board of your cross trainer. Your console will tell you how long you have been working out for, how many kilometers or miles you have travelled, the amount of calories you have burnt and your heart rate level. It will also give you information on and allow you to set your workout. As said above, with the cross trainer you control the movement but the resistance is controlled by the cross trainer. You need resistance to have an effective workout. Some of the budgets, lower end models use air to provide resistance to your movement but this is not something I would recommend at all. I would recommend you opt for a cross trainer with magnetic resistance and flywheel. This will give you a far superior resistance level while keeping your movement fluid and natural. The weight of the flywheel is what you are working (or resisting) against and you control the resistance of this right on your console. The heavier the flywheel the wider range of resistance you have. As a general rule, it’s wise to opt for cross trainers with the heaviest flywheel so long as they are made by a reputable company. Something else worth noting is that you can change the resistance right there on the console. This makes it easy to increase and decrease the resistance whilst working out. Crucial if you are doing HIIT or LISS and important even if you are not. Some of the budget cross trainers do allow you to change the resistance but it would be a manual action. So rather than pressing a button, you would have to step off the trainer adjust it, step back on and then carry on your workout. This will interrupt your exercise and its not very user friendly. Another very important point to note is to make sure the cross trainer you buy is made by a reputable brand who know what their stuff. With cross trainers being so popular today, we have many less reputable companies making them. While they may seem like you are getting a bargain at first glance, you just don’t know whats under the hood so to speak. This can cause problems in the machine as time goes on. Problems which may not be easily resolved. Buying a “cheap” cross trainer means buying twice and in between, spending time on the phone constantly trying to resolve the issues you’ve had. There are some very good brands out there which I would personally advise you to go with and on this site you will find only the best in cross trainers for your home. When buying a cross trainer it is easily and often overlooked at who else will be using it besides you. Both the height and weight are important factors to keep in mind. 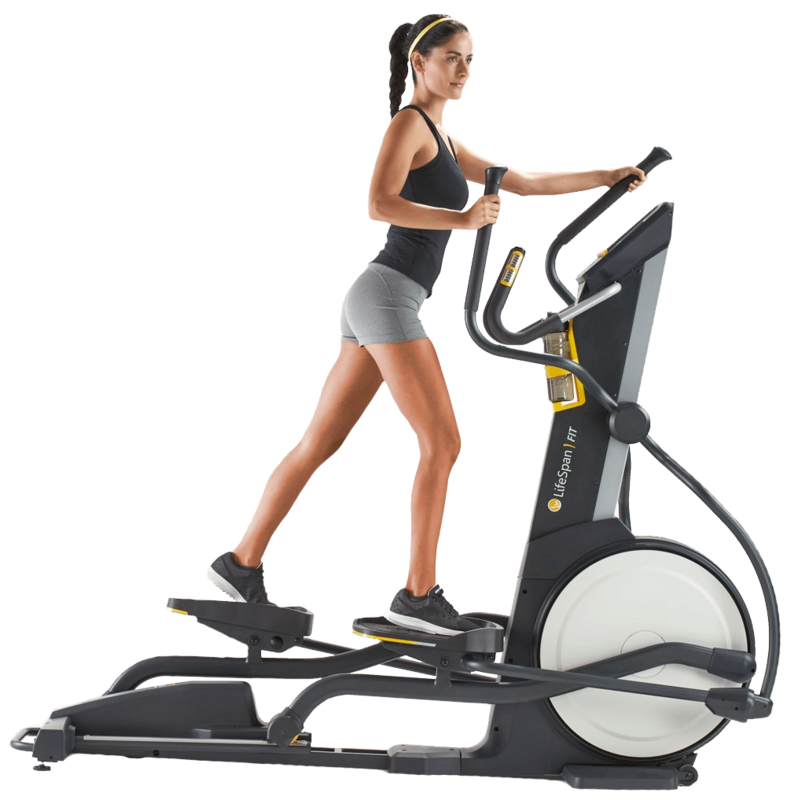 The weight will simply dictate on the maximum user weight allowed to use the cross trainer. If you are too heavy for the cross trainer then you can cause permanent damage to it. If this happens, you warranty will most likely not cover it because it is your responsibility to check this before buying and they will be able to tell the cause of the problem. The height is important because of the stride length. This is the distance between your legs on every stride you take. Shorter people have a shorter stride and taller people naturally have a longer stride. Buying a cross trainer with a short stride will not be good for a taller person. The movement will be very restricted and they will not be able to have an effective or comfortable workout. The same story on the other end of the spectrum, a cross trainer with a longer stride for shorter people will be very uncomfortable and definitely not recommended. Besides being uncomfortable, both of the above scenarios can lead to serious injury. The good news is you can get cross trainers with adjustable stride lengths so depending on who wants to work out, you simply manually adjust it when you want to workout.